Apple's product strategy has been receiving more attention lately as voice-first and AI-first become buzzwords in Silicon Valley. Questions regarding whether Apple even has a coherent product vision are on the rise. While Apple is no stranger to receiving skepticism and cynicism, the degree to which people are discounting Apple's product strategy is noteworthy. There is mounting evidence that Apple's industrial designers are following a product vision based on using design to make technology more personal. It is becoming clear that such a vision extends well beyond just selling personal gadgets. Apple's financials paint a picture of a company following an iPhone as Hub product strategy in which iPhone is the sun and every other product revolves around iPhone. Apple generated $140B of revenue and approximately $60B of gross profit from iPhone over the past year. These totals amounted to 60% and 70% of Apple's overall revenue and gross profit, respectively. As seen in Exhibit 1, over the past year, Apple sold 2.5x more iPhones than iPads, Macs, Apple Watches, Apple TVs, and AirPods combined. Upon closer examination, Apple is not following an iPhone as Hub strategy. In fact, the company has never followed such a product strategy. Apple is instead following a strategy based on selling a range of tools containing varying levels of personal technology. Management is placing big bets on four product categories: Mac, iPad, iPhone, and Apple Watch. In addition to the four primary product categories, Apple also sells a line of accessories. HomePod, AirPods, Beats, and Apple TV are positioned to add value to Apple's primary computing platforms. The bulk of these accessories are designed to control sound. AirPods and Beats handle sound on the go while HomePod is tasked with controlling sound in the home. Apple TV is unique because it is given the job of controlling both sound and video on the largest piece of glass in the home. This uniqueness is also evident with Apple launching the tvOS platform for third-party developers. While Apple's four primary product categories share a few obvious attributes such as possessing screens, there is a more important connection. 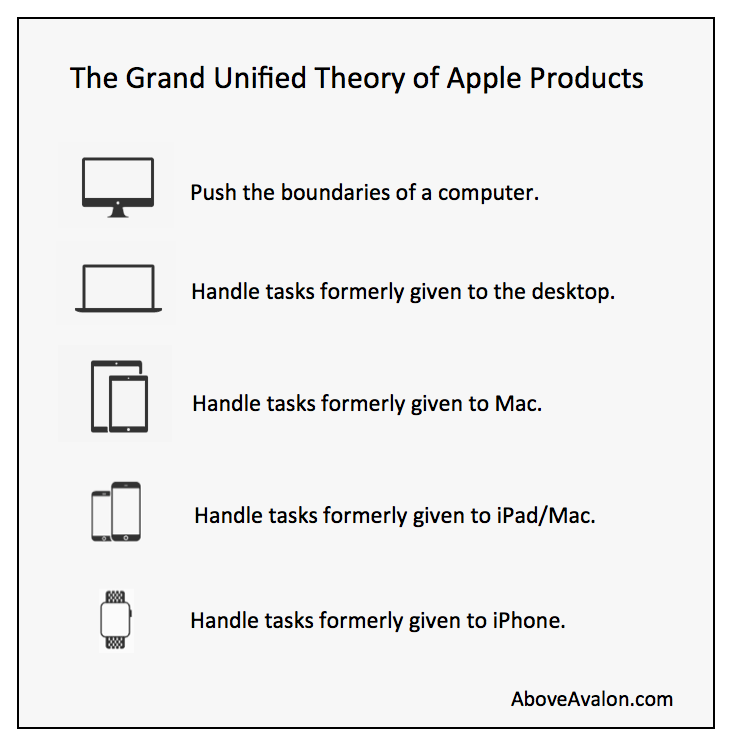 Each is designed to be an alternative to the next most powerful device as detailed in The Grand Unified Theory of Apple Products (shown below). iPad is given the job of being powerful and capable enough to serve as a Mac alternative. iPhone is given the job of handling tasks that may have otherwise gone to iPad. Apple Watch is tasked with doing enough things on the wrist that it can serve as an iPhone alternative. Multitouch computing represented a giant leap in Apple's quest to make technology more personal. Based on unit sales, it's fair to say hundreds of millions of people think iPhone and iPad are adequate Mac alternatives. In a similar vein, Apple Watch isn't designed to replace iPhone. Instead, Apple Watch is given the job at handling some of the tasks given to iPhone. The ability to put digital voice assistants on the wrist represents Apple's latest personal technology breakthrough. While Apple designers and engineers have shown the willingness to push Apple's four primary product categories forward, change is in the air. Apple Watch and the broader wearables category represent Apple's best chance to make technology more personal. One of the highlights from Apple's inaugural event last month at Steve Jobs Theater was a cellular Apple Watch. In fact, the Apple Watch portion of the event was the strongest part of Apple's presentation. After spending the past two years refining its Apple Watch messaging, Apple now has a more appealing and convincing Watch sales pitch for consumers. It's becoming clear that Apple's product priorities are shifting. Release an Apple Watch that is fully independent of iPhone. Position Apple Watch to handle more tasks currently given to iPhone. Release accessories that complement Apple's expanding wearables strategy. Position iPhone as an AR navigation device. Position iPad as a genuine Mac alternative. Position Mac as a VR/AR content creation machine. Combining the six preceding priorities into one cohesive product strategy leads to the following diagram. Resources and attention are flowing to the devices at the right end of the spectrum, the products most capable of making technology more personal. A cellular Apple Watch Series 3 is the latest step in Apple's journey to an Apple Watch that is completely independent from iPhone. Such a product will represent a watershed moment for Apple Watch as it would more than triple the product's addressable market. When it comes to Apple Watch serving as a genuine iPhone alternative, the addition of a selfie camera one day and an increased role played by Siri intelligence will go a long way in allowing Apple Watch to handle additional tasks formerly given to iPhone. There is a grand vision behind Apple's product strategy of selling a range of personal devices. Apple believes design is the ingredient that allows people to get the most out of technology. Even though Apple's industrial designers oversee this vision, the entire company ranging from engineers and product designers, to Apple retail specalists believe in focusing on the user experience. Apple views core technologies not as products in of themselves, but as ingredients for something else. Instead of copying other companies and chasing after technology's raw capability, Apple is more interested in technology's functionality as it relates to the user experience. It is easy to look at Apple's current product line of personal devices and wonder where the company will turn next. Additional wearable devices like AR glasses are inevitable and fit within a product line of personal gadgets. On the other hand, Apple's growing interest in transportation has been a head scratcher for many observers as a car doesn't seem to fit within Apple's product strategy. This has led some to wonder if Apple is getting away from its mission or vision in an attempt to chase revenue or users. Instead of assuming a self-driving car would be tacked onto the end of Apple's product line next to Apple Watch, the much more likely scenario is that transportation would represent a brand new product paradigm for Apple. The same idea applies to Apple's growing interest in architecture and construction. As shown below, Apple would have multiple product paradigms, each comprised of a range of products. This is the primary reason why Project Titan shouldn't be thought of as just a self-driving car initiative, but rather Apple building a foundation for its transportation ambition. In essence, Apple's transportation strategy would begin with a self-driving car but then eventually lead to the company developing more personal modes of transportation based on new user interfaces, fewer wheels, and different seating arrangements. This process would be equivalent to Apple starting with Mac and then using new user interfaces, technology, design, and manufacturing techniques to create products capable of making technology more personal. Apple would take a self-driving car and strip away capabilities in order to improve functionality. The same goal can occur with architecture and the broader concept of smart homes. It's difficult to see homes becoming truly smart until Silicon Valley begins building housing. The major takeaway is that Apple's quest to make technology more personal doesn't just apply to personal devices. Instead, there is a role for design to play in entirely new industries such as transportation and construction. Apple has run into its fair share of issues and roadblocks following its grand vision. As resources and attention flow to devices most capable of making technology more personal, Apple has made some questionable design decisions. The Mac Pro and Apple's overall approach to pro Mac users has not fared well in recent years. This serves as the basis for my "The Mac is Turning into Apple's Achilles' Heel" article earlier this year. Management was forced to back track in order to stem growing backlash within the pro Mac community. Even today, the amount of criticism pointed at the Mac, some of which is genuine, is trending at multi-year highs. The Mac debacle also ends up revealing some of the downsides associated with Apple's functional organizational structure. The company practices a focus mantra when it comes to product development, which may result in certain products getting left behind or not getting as much attention as they may need. This may make the jump into new product paradigms like transportation that much harder for Apple. While Apple's product line is still incredibly focused for a $825B company, there is no denying that additional models and SKUs have led to an expanding product line over the years. Apple's entire product line is shown below. Apple relies on a consumer segmentation strategy to target as broad of a market as possible for each of its four primary product categories. Apple has learned a lesson or two from the dark days in the 1990s. A byproduct of this strategy has been complexity being added to the product mix in recent years. Apple puts much effort, care, and deliberation into marketing. This makes one of the animated videos found on Apple's website so intriguing. As shown in the screenshots below, the animated video is meant to highlight HomePod's spatial awareness capability. The only two Apple products shown in the room are HomePod on a table and the two individuals wearing Apple Watches. There is no iPhone, iPad, or Mac in sight. For some companies, this can be brushed off as a simple oversight, but not for Apple. It's intentional. Apple looks at Apple Watch as the natural evolution of personal computing. Having Siri intelligence on the wrist throughout the day, in addition to receiving and consuming information via a screen, is powerful. Meanwhile, HomePod is positioned as an Apple Watch accessory capable of delivering sound in a way that just isn't feasible for a device worn on the wrist. While some companies are advocating new product strategies such as voice-first or AI-first, Apple is taking a different path with a product strategy evolving into one based on wearables. Voice and AI are then positioned as core technologies powering these wearable devices. To a certain degree, this is the inevitable path Apple has been on for the past 40 years. Going forward, the largest opportunity for Apple will be found in using its product vision to create personal technology paths in new industries.